DC's social entrepreneurs appreciate arts spaces like the Kennedy Center. Image by Bill used with permission. Across the country, cities tout policy carrots like tax incentives or development projects to attract and retain workers and industries. However, new research shows there are other things a city can do to boost a particular class of ethically-minded entrepreneurs–called social entrepreneurs–as they launch and grow their ventures. Access to funding, quality of life, and other traits determine the health of social entrepreneurship in cities across the US. So does DC have what they need? Halcyon Incubator, a Georgetown-based nonprofit, polled social entrepreneurs across the country about what they look for in a city. The responses fell into four main categories, including access to funding, regulation and receptivity, human capital, and quality of life. Researchers then analyzed publicly available data to see how welcoming American cities are to these ventures. Strong academic institutions like Howard University are a draw for social entrepreneurs. Image by Ted Eytan licensed under Creative Commons. Access to human capital: Halcyon defines access to human capital as a combination of the number and quality of local universities, the percentage of college graduates, voter turnout, and the rate of volunteerism. DC is routinely named one of the most educated labor markets in the country, with professionals and graduates from all over the country and the world attracted to the region’s strong job market and (until recently) secure federal jobs. Similarly, nationally-recognized universities such as Howard, Georgetown, George Washington and American attract talented students and staff while churning out highly-skilled graduates. Government regulation and receptivity: DC ranked third overall in this category, defined as the “operational environment of the ecosystem” including “regulations, market receptivity, and even perception and attitudes.” The report breaks out firm survival and founding rates, regulations around small businesses, legal designations or carve-outs for social entrepreneurs–and interestingly, Twitter activity around social entrepreneurs. DC scored relatively highly on each of these points, though the ranking seems buoyed by the city’s high social media score which may not be a very useful indicator. Community resources: DC really shines in this category, which includes the many cultural amenities that city residents take pride in such as arts and entertainment spaces and events, libraries, and health. Transport: DC’s walkability and bike-friendly policies and options kept the city’s transportation score in the top ten. Diversity: While deep questions about gentrification and displacement simmer in DC, the city is particularly ethnically, racially, and nationally diverse. Lack of affordable housing (and affordability in general) continues to be the city's Achilles heel. Image by NCinDC licensed under Creative Commons. DC remained in the top 10 for all categories, and performed better than approximately 75 percent of all polled cities in terms of access to funding and in quality of life. However, those two remain the city’s weakest points. Access to funding: DC ranked eighth out of 21 cities in access to funding, largely due to healthy public and private spending and investment. Where DC fell short in this category was charitable giving, ranked 14 out of 21. This is somewhat surprising since there are a large number of nonprofits and charities in the city and the region. The category’s measurements, defined as “Local charity best practices ranking” and “Individual donations to charity,” might partly explain this discrepancy. The Chronicle of Philanthropy’s latest statistics indicate that DC residents donated roughly 2.9 percent of their earnings to charity in 2015 (the most recent year that data is available for), totaling approximately $6.3 billion. While this sounds impressive, that percentage was still below the national average, leaving a giving opportunity of over half a billion dollars. 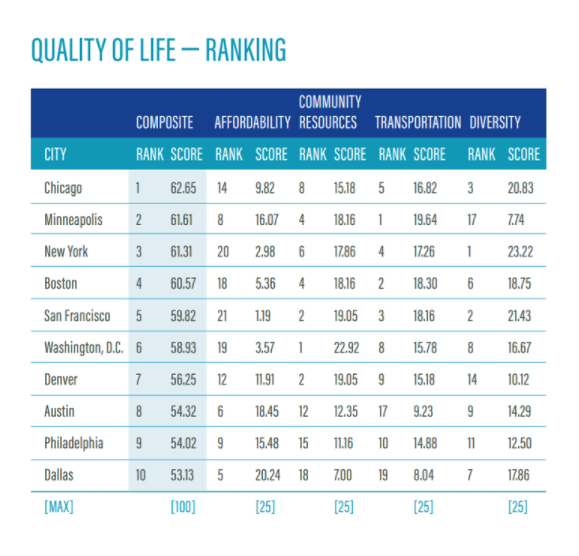 Affordability: DC ranked 6th for overall quality of life. While the city scored highly for almost all of the category’s criteria, DC fell to the bottom in the affordability category, coming in 19 out of 21. This is unsurprising, as DC is consistently ranked one of the most expensive cities in the country, with a cost of living that exacerbates local inequality. Stressors like lack of affordable housing and high prices for everyday items bring down DC’s ‘livability’ for entrepreneurs just launching their businesses. Social entrepreneurs found ventures that are explicitly dedicated to solving a social, environmental, cultural or other humanitarian issue. They include non-profit and for-profit groups, and can pair traditional market incentives, like tax reductions, with a business model more like a startup to bring ideas to a wider audience. Some local examples that came out of this incubator include Foodhini, which is non-profit, and for-profits Heartful.ly and Up Top Acres. Cities have taken a great interest in this class of entrepreneur, as many issues traditionally served by government programs or the nonprofit sector can be quickly and easily disrupted by these businesses, thereby saving government resources and creating jobs. Social entrepreneurship has also shown marked growth in the past decade as younger entrepreneurs seek out causes important to them, rather than creating the next dating app. Numerous colleges and universities now offer programs specifically tailored to this type of startup, promising sustained investment in social impact. DC fared well this year as it did the last in supporting social entrepreneurs and their work. However, clearly there are stressors that make this city less appealing to social entrepreneurs if left unaddressed. Increasing housing prices show little sign of slowing, let alone decreasing. Similarly, the near-constant stream of metro renovations and problems will drag down DC’s transportation score, as residents take longer to get to work. Ultimately, these macro issues will continue to weigh on the district’s economic outlook for years to come. For now, this report reminds us that all of these issues are connected, and that addressing one sends ripples throughout the entire city. Disclosure: I used to work for a PR firm which handled media outreach for Halcyon. I am no longer employed there but remain in contact with their staff on a professional basis. I do not receive any compensation from Halcyon. If you are at the Dunn Loring Metrorail station and head east on the Orange Line, what is the next station you will reach? Feel free to ignore station subtitles.